Additional information about the Yakovlev Yak 11 Graphic: One of a hoard of 41 Yaks's recovered from Egypt in the '80s by the French aeroplane trader Jean Salis, the hoard consisted of Yak 11's and Yak-18's. Siteseen Ltd. are the sole copyright holders of this Yakovlev Yak 11 picture, unless otherwise stated. We only authorise non-commercial picture use and particularly encourage their use for educational purposes. 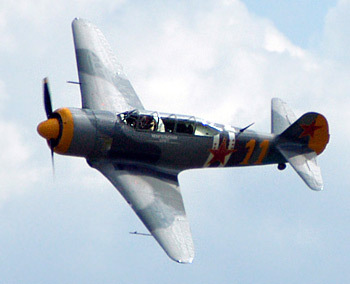 This Yakovlev Yak 11 picture is not in the Public Domain.